PSBT is a non-governmental, not-for-profit trust with the mission to create and sustain a credible space for public service broadcasting in India which is independent, participatory, pluralistic and democratic, distanced from commercial imperatives and state/ political pressures. We work to mainstream the Indian documentary and empower independent filmmakers by commissioning and mentoring films from across the country. Bhairav, according to Hindu mythology, is the supreme ruler of time. The film takes place in a narrow lane in a North Indian small town.Three young men are engaged in a virtual game of poker on their cellphones. Meanwhile, at around midnight, a young couple is returning home from the call centre they work at. Barriers between the real world and the virtual world collapse. Gaurav and Atul are two school friends celebrating the end of their exam. A detour to a brothel and a chance encounter with a cop brings out the worst in them. The short fim Andhere Mein is an adaptation of a story by the same name by the wellknown Hindi writer, Nirmal Verma. The story revolves around four characters, a young boy , his parents and a family friend. The child now grown up into a youngman recollects the events leading to a violent altercation between his parents during a particular summer break in the town of Amravati. The film tries to create the universe of a child as he tries to understand the tension between his parents involving the family friend. A fun adventure of a young girl having her first hair cut in an all men’s salon. Abhisarika a 16-17th century Indian literature phenomenon which has been painted in a series of Ragamala Paintings has been interpreted and subverted in contemporary times. Sarika is a lover of music, nature and she is mostly longing to get loved and feel the physical presence of her husband around her. One night she get decisive about seeking pleasures in the longing of her husband. The film explores how even the natural element conspires against this desire of a married woman to prevent her from breaking these social codes of morality. Will Sarika attains the solace by doing so?? Established as ‘Film Institute of India’ in 1960 on the erstwhile Prabhat Studio premises at Pune, FTII boasts of a rich legacy in quality Indian cinema. The Prabhat Studios were declared heritage sites by the Pune Municipal Corporation and are used by the students to this day. 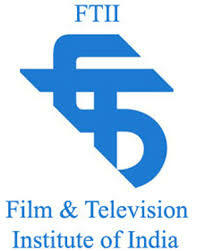 The Institute was renamed ‘The Film and Television Institute of India’ in 1971. The Television Wing, earlier located at the Mandi House, New Delhi was shifted to Pune in the early seventies, bringing together the training in film and television under a common roof. At its inception in 1974, the Television wing was concerned with the provision of in-service training to personnel from Doordarshan. This Wing has in recent years launched a one-year course in Television. A poor tribal man, in the village of Jharkhand, struggle to sell his country poultry in village market where farm poultry has made in road, in order to buy a hockey stick and shoe for her daughter, Munuren. Meanwhile Munuren, with her younger brother, Prakash, has embarked on their journey in search of God in the forest who will bring their lost poultry back. A court notice for an old building brings five brass band players together after a very long time. ‘Sadabahar Bras Band’ is the story of these performers reminiscing long lost purpose of their lives, before their beloved place turns into shambles. Born on 5th May 1985, Tushar More after completing his Graduation in English, did his M.A in English Literature. He got into Film and Television Institute of India in 2010 and his debut short fiction film ‘Firdous’ premiered in Pune International Film Festival and also won Kodak Student Award. ‘Sadabahar Brass Band’ is Tushar’s Diploma Film for FTII Pune. Gudh reminisces those childhood memories, which perhaps everyone went through in life. Those obscure moments etched into our memories, which we find hard to correlate as grown-ups. It’s about Ajay, his childhood, his love for his mother, his village, its ongoing revolution and the changes it brings forth. SRFTI has succeeded in articulating and disseminating classical and contemporary theories of praxis for the creative minds to leap into the world of professional practice : be it mainstream, parallel,art-house, experimental or non-fiction narratives.The Institute has crossed many mile stones towards a new paradigm of the art and craft of Film making.